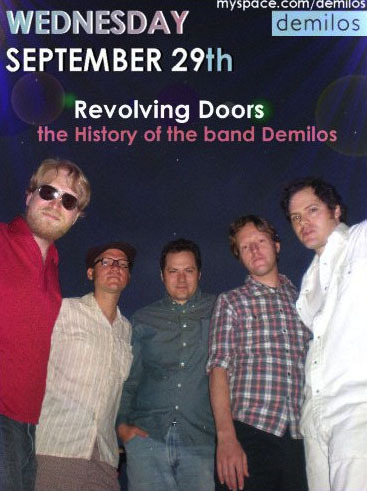 Films about rock bands are nothing new, but when director-musician Mike Snider set out to document the 15-year evolution of his group with Revolving Doors: The History Of The Band Demilos, he faced a major challenge. He needed to find ways to hold viewers’ interest while exploring the career of an alt rock/comedy group that’s pretty much unknown outside of the Chicago club scene. Working with assistant directors Angela Taylor, Eric Ferguson, and the other band members, Snider crafted a well-paced hour of interviews with current and former members; still photos; live performances at venues like Subterranean and Java Jim’s Music Theater; appearances on local shows like JBTV; and informative sessions at the Low Orbit recording studio. The documentary has aired on WJYS TV 62 in Chicago and a 13-minute version can be viewed on YouTube. Fortunately, the Demilos have more going for them than a lot of local bands. Melodic songs like “Used To” and “Catch The Cure” are genuinely clever, and a glance at the credits on their 2010 self-titled CD reveals that twin brothers bassist-guitarist Brian Daley and drummer Joe Daley; guitarist Jeffrey Kmieciak; keyboards player Michael Snyder; and guitarist Finn Swingley are all capable of handling lead vocals and playing various instruments. Each is an accomplished songwriter as well. With so much talent on board, ego clashes are unavoidable, and Revolving Doors tactfully reveals how members like guitarist-vocalist Brett Callaway have left over the years to pursue their own goals. Some eventually returned to the fold, which is a testament to the chemistry these musicians share. The Demilos also have a knack for creating inventive and professionally-edited rock videos like “Airplay,” “Cosmonaut - Theme For Dying Space Stations,” and “Channel Me.” Revolving Doors explains how the Demilos became more tech savvy over the years, retaining the cutting edge of their punk roots while adding space age sounding keyboards and other special effects. The interviews done at Low Orbit Studio are particularly interesting as Joe Daley and Swingley explain how and why certain effects were created. Ultimately, Revolving Doors does a good job of celebrating the Demilos’ dedication to their music, and will hopefully introduce them to a new audience.